About R&D Scheme: Research and Development scheme was introduced to conduct surveys and studies of important crafts and make in-depth analysis of specific aspects and problems of Handicrafts in order to generate useful inputs to aid policy Planning and fine tune the ongoing initiatives; and to have independent evaluation of the schemes implemented by this office. Following activities will be under taken during the 12th Plan. i. Survey & Studies on different topics. ii. Financial assistance for preparation of legal, para legal, standards, audits and other documentation leading to labeling/certification. iii. Financial assistance to organizations for evolving, developing a mechanism for protecting crafts including languishing crafts, design, heritage, historical knowledge base, research and implementation of the same enabling the sector/segment to face challenges. iv. Conducting Census of Handicraft artisans of the country. v. Registration of Crafts under Geographical Indication Act & necessary follow up on implementation. vi. Assisting handicrafts exporters in adoption of global standards and for bar coding, including handicrafts mark for generic products. vii. Financial assistance for taking up problems/issues relating to brand building and promotion of Indian handicrafts. viii. Conducting of Workshops/Seminars on issues of specific nature relating to handicrafts sector. Workshop/Seminar to sensitize participants on various issues faced by artisans of specific crafts. Survey/Studies on various issues to find out solutions to resolve problem faced by artisans. Registration of Craft under GI(Geographical Indication) Act. Brand Building to promote specific craft . TA/DA to participants to attend the workshop/seminar the tune of Rs 55,000 per month. Question : Definition of Handicrafts? Ans: Any item predominantly made by Hand….. graced with visual appeal….. in the nature of ornamentation or inlay work or similar work with substantial artistic nature not a mere pretence. Question: What is a Geographical Indication? 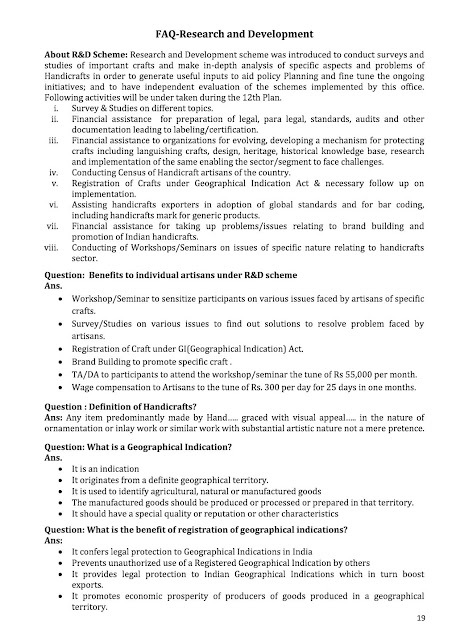 Question: What is the benefit of registration of geographical indications? Question: Who can apply for the registration of a geographical indication? Question: Who can use the registered geographical indication? Ans : An authorised user has the exclusive rights to the use of geographical indication in relation to goods in respect of which it is registered. Question: How long the registration of Geographical Indication is valid? Question : Kindly provide the list of GI registered crafts. Ans: List of GI registered articles is available on portal of Office of Controller General of Patents, Designs & Trade Marks i.e. http://www.ipindia.nic.in. Question : Definition of Endangered(earlier called Languishing) crafts. Definition arrived at after a study was conducted through NIFT, New Delhi. 1. The total numbers of craft practitioners are less than 25. 2. Crafts persons have replaced craft activity with another activity because the craft practice is unviable… if reduction in time spent on the particular craft is more than 50 per cent in the past three years. 3. Next generation in the family is not learning the craft and there is no recruitment of new persons outside the family. Percentage of new recruitment is less than 40%. Question: Kindly provide the list of endangered crafts. Sanjhi Crafts of Mathura, U.P.